Ok who likes music? EVERYONE!!!! Have you heard of the Heart Of Scotland Choir? Made up of talented singers from the Forth Valley area, not only do they sing traditional songs but you can hear their take on Dolly Parton, The Foo Fighters, Kings of Leon... (I could go on but we'd be here a long time) Why not find out for yourself? They have a gig in Falkirk Town Hall this Saturday night (18th Feb) click on the image below for details! 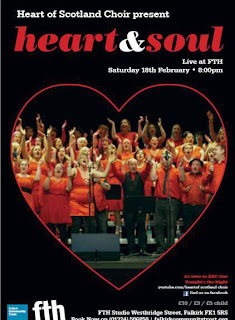 The choir will be performing a fantastic set of songs for their debut in Falkirk called "HEART AND SOUL", would make an excellent valentine's gift or a lovely night for all the family!! : )) Tickets are £10/£9 and £5. However, not many people know that I also run a "drop in" Jewellery club every second Wednesday. There is no need to book for the Jewellery club, just turn up! Basically tell me what you want to make and I'll show you how to make it, we have beads and findings for sale in the Resonate shop OR bring in old broken jewellery/beads and we'll create something new. Click on image below to see samples of items we've made at Resonate workshops! Dates for this month are 15th and 29th Feb, 6pm till 8pm, cost £5. Come along and get creative!